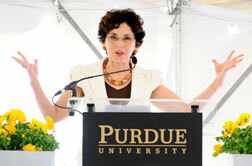 France A. Córdova became Purdue's 11th president on July 16, 2007. She is the first woman to lead the institution and has overseen a strategic plan that emphasizes student success, research deliverables and global engagement. During her presidency, she has led Purdue to record levels of research funding, reputational rankings, and student retention rates; championed diversity among students, staff and University leadership; and promoted student success, faculty excellence, and programmatic innovation. Under her leadership, Purdue has raised $1 billion in private philanthropy and expanded its role as a top research institution on the global stage. 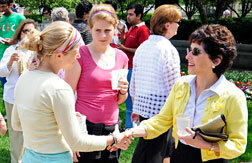 This timeline highlights some of the significant events of Dr. Córdova�s Purdue presidency.